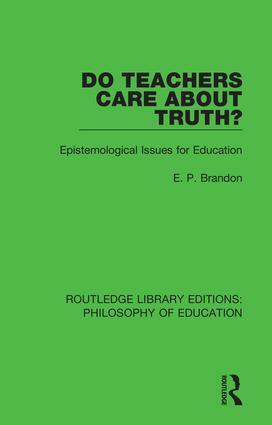 Do Teachers Care About Truth? This book, first published in 1987, examines the notion of truth and then discusses knowledge and the way in which much of our knowledge revises or rejects the common-sense we start from. The author argues that our knowledge is not as secure as some would like to think and that there are important limits to the possibility for explanation. He shows how values permeate our ordinary thinking and argues against the objectivity of these values, showing the practical consequences of this argument for teaching in schools. This stimulating approach to a fundamental educational issue does not require previous experience of formal philosophy and will be useful to both education students and teachers in schools. This set of 21 volumes, originally published between 1955 and 1997, amalgamates several topics on the philosophy of education, with a particular focus on religious education, curriculum studies, and critical thinking. This collection of books from some of the leading scholars in the field provides a comprehensive overview of the subject and will be of particular interest to students of philosophy, education and those undertaking teaching qualifications.